Those exhausted by Hollywood reboots and sequels will be really upset when they realize that the trend is making its way to Washington, D.C. The government shutdown that lasted from Jan. 20 to Jan. 22, a remake of the 2013 shutdown, is already headed for a sequel on Feb. 8. The future of immigration, namely the future of undocumented immigrants brought to the U.S. as children, the border wall and chain migration, were at the heart of the initial shutdown debate. And all in all, the shutdown could have been resolved if not for President Donald Trump’s indecisiveness. Government Shutdown Episode I, despite lasting only two days, may end up costing the economy billions of dollars and undoubtedly had damaging effects on hundreds of thousands of federal workers, many of who still haven’t received their proper compensation for the shutdown in 2013. And the agreement reached in Episode I only funds the government until Feb. 8, setting up the stage perfectly for Government Shutdown Episode II. In September, the president announced that he would end the program with a six-month delay, with the intention of kicking the issue to congress. The president said he wanted funding for his proposed border wall and cuts to chain migration policies in exchange for protections to DACA recipients. He stressed that he was willing to negotiate with Democrats, and even went as far as to say that he would sign whatever bipartisan bill Congress agreed on, a statement he quickly backtracked. Days before the shutdown deadline, White House Chief of Staff John Kelly went on Fox News to say that he has convinced the president that the border wall is unnecessary, another statement that the president quickly denied in a tweet. And in between those two incidents, the president was approached by lawmakers with a bipartisan bill that included funding for the border wall, limited chain migration and reduced diversity visas.The president said no. So the issue escalated, leading to the shutdown, the finger pointing and the passing of a spending bill without resolution on immigration. 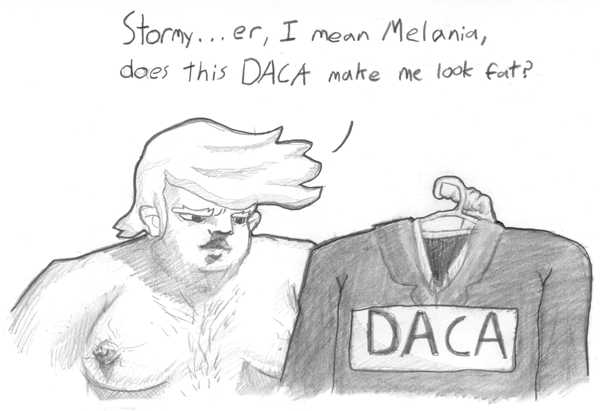 Regardless of anyone’s individual stance on DACA, and aside from the fact that President Trump went from definitely cutting it to treating it with heart to dealing with it like poker chips on a high-stakes wager, the larger issue is the president’s inability to understand, and communicate, what he wants. Out of all the accomplishments that the Trump administration has made sure to boast about, from Trump’s campaign tapping into “something magical” during the election cycle to the self-proclaimed “historic victory” in passing a bill to overhaul taxes, the one thing that the Trump team, and subsequently the Republican party as a whole, has been unable to properly convince anyone of is the validity of their stances. They’re a party in power with no clear goal or limitations.